I cannot tell you how excited I am for the Awkward and Awesome link up! These are some of my favorite posts to write, and I can’t wait to see what you all share! Life is both awkward and awesome, and I think it is good to celebrate and share all those moments. This month has been kind of weird for me. Lots of awesome things, but a few awkward things too. I am trying to keep to my word of the year, and celebrate all of life’s little moments. - I picked up a different dry shampoo than I have been using, and used it as I normally would. I didn’t notice the white roots I had until I got to work. Due to the poor lighting in my bedroom, I looked like I had some funky grey roots. - This is sort of weird and random… but has anyone ever had a banana that has a little red “core”? I was minding my own business the other day, eating a banana at my desk, and noticed a funny taste at the first bite. I looked down at it and noticed this thin red line at the center, and it went all the way down the middle of it. I immediately threw the rest away, because I didn’t think that could be right. Does anyone know what this is?? - I hate that I have been so ambiguous about this, but I just got some news about my health that I am trying to write a post to share with you about. Hopefully next week I can get something out that is detailed and coherent. In the meantime PLEASE do not worry. I’m not sick, not sad, and I am going to be fine. This just isn’t something that I want to just write a few sentences about. - I ordered a dress from LuLaRoe for the first time ever! My cousin had a facebook party, and I jumped right on purchasing a dress. I got a Nicole dress, which is red with blue umbrellas on it. A company that’s motto is basically “comfort fashion” is definitely something I need more of in my life. - I got a family size box of Lucky Charms on Monday, and have been eating them ever since. Probably a very unhealthy amount. But they are so stinking good, and just what I want when I come home from work. I mean… they are magically delicious! - We are going to visit our friends in New Jersey this weekend! I can’t wait to catch up with them and see their beautiful new house. - Our wedding invitations are ordered! I can’t wait to give you a sneak peek! I spent a TON of time going back and forth with what I wanted. I finally found an Etsy shop with all these different hand lettered printable invite packages. I asked for exactly what I wanted, and my dad is going to print them at his shop. - We are in the 4 month countdown to the wedding! More on this on Wednesday! 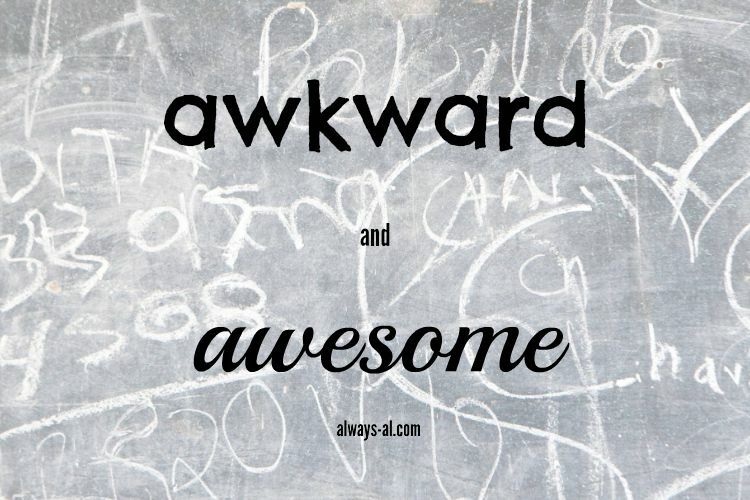 Make sure to link up your awkward and awesome moments this month! I can't wait to read them!